Supplementary material reads: "Blowitz-Maskel. HO 23291. 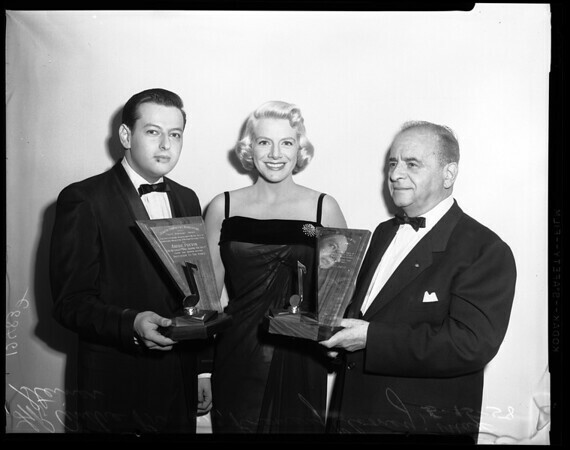 Rosemary Clooney presents the first awards of the Screen Composer's Association to composers Andre Previn (L) and and Max Steiner. The awards, planned as an annual event, are for 'distinguished contribution to the art of composing music for motion pictures.' Steiner was first president of the association formed thirty years ago. Its membership, now numbering 140 in all parts of the world, have won 40 Academy Awards and 210 Academy nominations, as well as numerous awards from other organizations."